Why TBG South Indian Bridal Jewellery Set Rentals are Popular? TBG > Blog > Why TBG South Indian Bridal Jewellery Set Rentals are Popular? TBG is the one name for all the bridal needs of the South Indian brides. Any South Indian bride can do all her wedding arrangements through the various services offered by TBG. From wedding saree to bridal makeup, hairstyles, bridal jewellery and bridal Mehendi; everything is being offered in by TBG. As a South Indian bride, your wedding look gets the perfect touch with the varieties offered by TBG. The TBG online portal brings to you the exclusive and vast collection of traditional South Indian bridal jewellery sets as well as latest modern jewellery. Have a look at the possible varieties you may like to opt from, for your gala wedding. Here is a complete set of traditional South Indian bridal jewellery set comprising the ancient mango mala, baju bandh, kamar bandh, jhumkas with chains, maangtika and also hair accessories. All are having the traditional temple jewellery look which is typical to the South Indian culture. 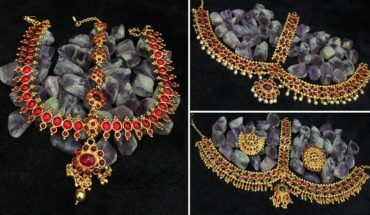 Here is a fancy and modern bridal jewellery set for all you South Indian brides who are gearing up for their wedding. As you can see, all the jewellery pieces in this set have a very modern touch in their design; you make an upbeat statement for yourself in this diamond and rubellite set. This is a traditional South Indian jewellery set having an antique touch. The design is what we call Nakshi Temple jewellery. Nakshi design carries designs or carvings of Gods and Goddess in them. This exquisite uncut diamond necklace set fits best for the wedding reception for any South Indian bride. This big glittering stones shine you on your special day. TBG always come up with the best quality stones for their jewellery collection. This traditional temple jewellery set has an intricate work with small beads and coloured stones. The floral pattern coupled with the mango design has been thought to blend the modern and traditional designs together. Why is TBG’s South Indian Bridal Jewellery Rental is Popular? The TBG rental jewellery has gained popularity cause of the economic and reasonable rates yet having the best quality. The credit to hold a wide range of modern and traditional bridal jewellery, keeping in view various taste and preference of South Indian brides. How TBG connect the Brides to the Jewellery Owners? As soon as the bride contacts TBG, our bridal consultant sends relevant pictures of their works and stock and also connects her with the jewellery owners. Next, the bride is supposed to select the pictures or designs they like and then they collect the desired jewellery set from the owner’s physical shop. At times the owner also couriers the set to the brides. Do let us know about your views, suggestions and queries on jewellery rentals via the comment section below. Feel free to reach out us for your wedding arrangements. TBG team will offer you only the best possible arrangements for your wedding, keeping your taste and preference as the priority.